Five years passed; England had entered the war; her men enlisted; a March offensive was being pushed along the front; several companies were sent out. The drive succeeded, but not a few English “Tommies” lay dying on the field when it was deserted by the victors. Two lay near each other, waiting for the dawn. One was grey-eyed and in the mist of early morning he seemed very pale. The other was blond and blue-eyed and white with pain. The only color to him was a gradually spreading red stain over his chest. They looked at each other and the grey eyed one spoke painfully. 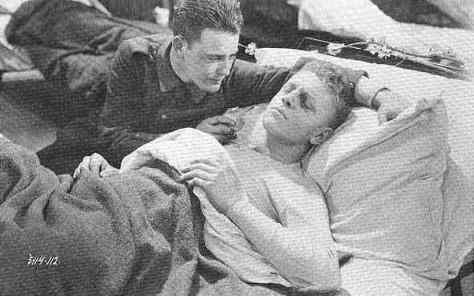 Paul tries to comfort his dying friend in All Quiet on the Western Front (1930). “Yes,” said the other, “so should I. It’s odd you know – like this, I mean. 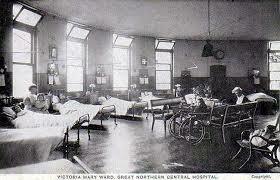 I was going to do so much while I lived – and here I am – dying in this –!” He coughed painfully and could not go on. “Charlie,” said the blue-eyed one between coughs. “H’dy’a do, Tommy,” said the bright haired one reaching out a blood-stained hand. “Very well, thank you, “ said the grey-eyed one, taking it. 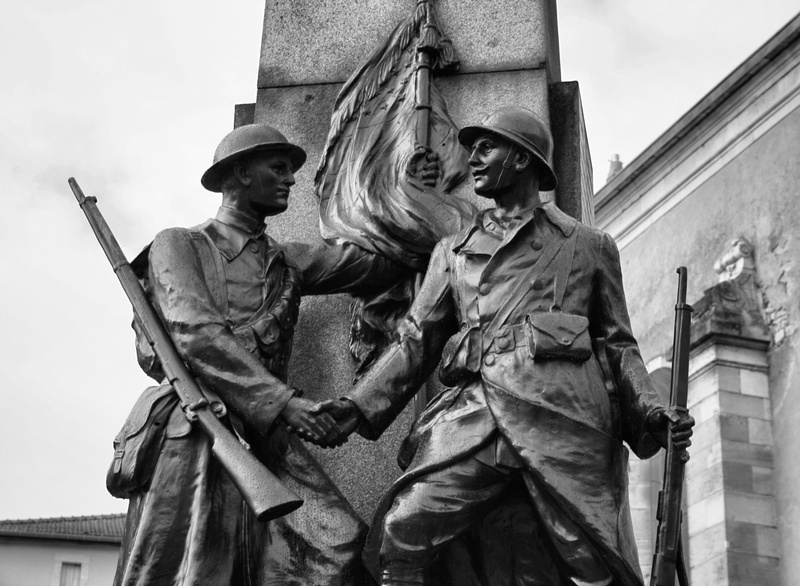 Statue honoring American Expeditionary Force in World War I. Here an American doughboy shakes hands with a French soldier. Read about WWI monuments like this one here. “D’ya know, now, we’re dying,” gulped the bright-haired one. The bloody sun came up through the mist and cast long blue shadows as it looked at the two, lying side by side, even as they had lain twenty three years ago, side by side, the fair-haired and the dark, beneath the same sun. And as they lay, their faces seemed to become the same again, and their countenances were those that had been, and it might have been before, instead of this twenty three years later. And then the mist closed in upon them. 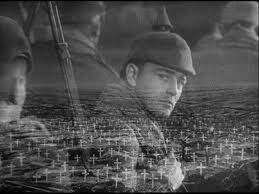 From the film All Quiet on the Western Front. To read earlier parts of this story written by Joan when she was 13 years old, click here for part one, here for part two, here for part three, and here for part four. Was it imagination or did the red sun really smile more broadly as it observed his wondering face? To read earlier parts of this story written by Joan when she was 13 years old, click here for part one, here for part two, and here for part three. 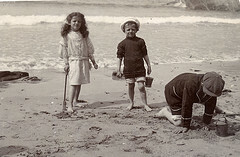 Ten years later, in 1904, on the same beach the same sun looked down on a bright haired twelve-year-old struggling in the water off the almost deserted beach. Another boy, dark and grey-eyed, came down to the beach for a swim and, seeing the struggling boy, dove in to save a life. As he dragged the boy back to shore, a crowd gathered from seemingly nowhere and watched his progress eagerly. When he finally landed on the beach and pulled the boy ashore, a cheer arose from the throng. To read earlier parts of this story written by Joan when she was 13 years old, click here for part one and here for part two.